My frustration with the Doctors and Specialists is growing by the minute. When we went to the Doctor a couple of weeks ago, I forgot to ask for a script for the gait trainer we want to order so I called last Monday and left a message. They say on the message to allow two business days for them to respond and here we are nine days later and still no script which means no gait trainer for Alex. I hope it comes through this week so I don't have to drive down to get it in person. The past two days of therapy, Mr. Alex has been a little stinker to his therapists. He is coming into his own little personality more and more and he isn’t afraid to show it. He absolutely hates four point (bearing weight on all fours) He can do it, but doesn’t like to and he has expressed that very clearly both yesterday and today. Overall Alex is a happy kid. He smiles, laughs and cuddles 90% of the time. But lately he has been expressing his displeasure not only in therapy but in what I like to call “Evan Interference”. This is when I am either assisting Alex in sitting or standing while he is playing with a toy and Evan comes up and wants to play to. Sometimes, Alex is in the right when Evan steals the toy or plays too aggressively, but when he is just there wanting to play alongside his brother, I have to explain to Alex that he needs to share. Over the past six months or so since Evan has been walking, I have had to discipline him a lot more than I have Alex. Obviously with Alex not being as mobile, he doesn’t really get into much….with one exception: The blinds. We rearranged the boys’ room awhile back so that Evan was away from the window (and the blind cord) and we put the changing table in front of their window. Every time Alex is on the table, his little fingers dig into the blinds and he pulls on them. I always say his name in a lower tone so he knows I mean business, and his face is priceless. Sometimes I have to turn my head to keep from laughing or smiling because he is so cute because he knows he is in trouble. Like most toddlers he has a short term memory so this has become a daily discipline. Speaking of blinds, Evan has a new obsession with the ones in the family room. It’s kind of funny because this is definitely something he gets from me. Our family room has three windows and if you open or close the blinds on any of the three windows, the other two have to match! It makes me laugh just to think about it! Every morning now, our routine is to go around to all three windows and open the blinds. Tonight, Eric closed one and Evan was right there pointing at the one next to it saying blubber words to close it. It took him a few minutes to realize that the third window on the other side of the room was still open, but he made sure to tell Eric to close those as well. People who know me know I like balance as well, so this is something that Evan has gotten from me! It’s also probably why I had twins. One child would have been unbalanced for me! Today in Alex’s OT session, he practiced picking up small food and attempted to feed himself. This is NOT an easy task for my little man. He has never been able to do it on his own, but I feel like now is the time for him to get started. When food is on his tray, he rakes his left hand at it and if he does happen to scoop up a piece or two, he instantly drops it. I haven’t had the patience to sit and work with him like I should, but it’s something that needs to be done. I don’t feel like they have focused on it as much as I would like them to in his sessions, so I suggested we start today. I was very impressed with his first attempt at it. It took him most of the session to work on it and after many failed attempts he scooped a little goldfish up off his tray and put it right in his mouth! Of course I cried and so did Jen (his OT) which made me cry even more because it just shows how much he means to her and how much she cares. Last week in Alex’s PT session we tried out a new gait trainer called the Mustang. It was super nice and we are waiting on a script from the Doctor so we can go ahead and place the order. This trainer will help Alex become more mobile as well as help him stand a little more often than he does now. He didn’t do a whole lot of walking in it that day, but it seems like a nice fit. It glides nicely and looks comfortable for him. It’s a very long process with insurance approval but I am hoping we have it by June so he can roam around outside with it. We also saw the Physiatrist last week as well. I don’t know who these specialists think they are, but I have had just about enough of them. If you recall, our last appointment with this guy didn’t go well either and this was just the icing on the cake for me. We waited 45 minutes to get into his office for him to just rush us right out of there. Back in December he suggested that Alex wear his Benik vest a little more often to see if it helps with sitting and he wanted to order him night splints and do some exercises on the ball with him. He made NO mention during our appointment last week of any of these things. He never asked us how things are going or if we should continue or not. He just suggested yet ANOTHER brace for Alex and mentioned how his feet cross/scissor when he stands him up. Alex rarely crosses his feet when we stand him up. Yes, his feet are very close together, but they don’t scissor. He went on and on about this and how he doesn’t know what our PT is doing and if she is working on this issue or not. Well, he should know because she sends him reports, but I am sure he reads those just as well as he reads Alex’s chart. We are going to this guy so that he can help guide us through this process with Alex but every time we leave there, we leave unsatisfied and confused and it shouldn’t be that way. So, we have decided to switch to the other Doctor in the area and see if we have better luck with him. I am planning on making that appointment in the next month or so. This is such a ridiculous process just to get a little guidance and help with our little boy but no matter how frustrating it may be I will never stop fighting for him. 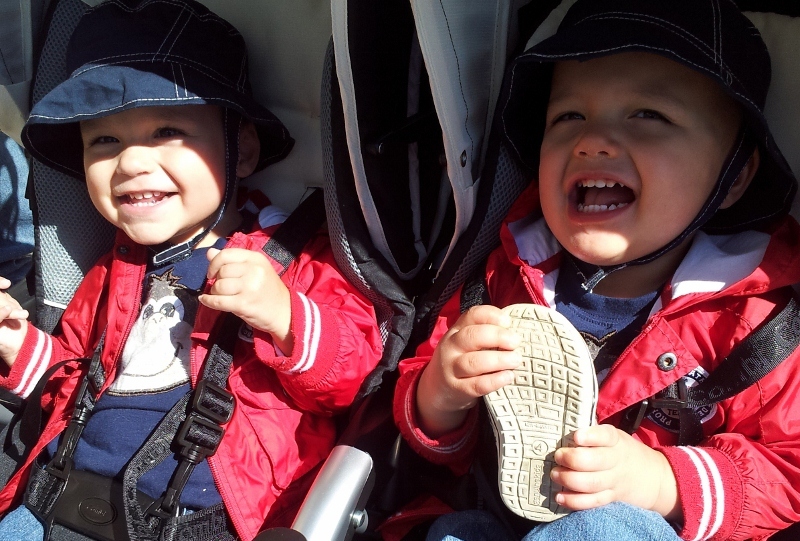 When we left the appointment, we took the boys to lunch and then to the mall to walk around. Evan is quite the little ladies’ man. He was flirting it up with the girls working in the stores and even went into one store and bee lined it to the fitting rooms! He is hilarious! These girls just eat it up – they love him! Don’t think Alex is left out, he quietly sits in the stroller and after Evan makes his grand entrance they turn to Alex and he flashes his million dollar smile and melts all of their hearts. I think I may have two little heartbreakers on my hands. 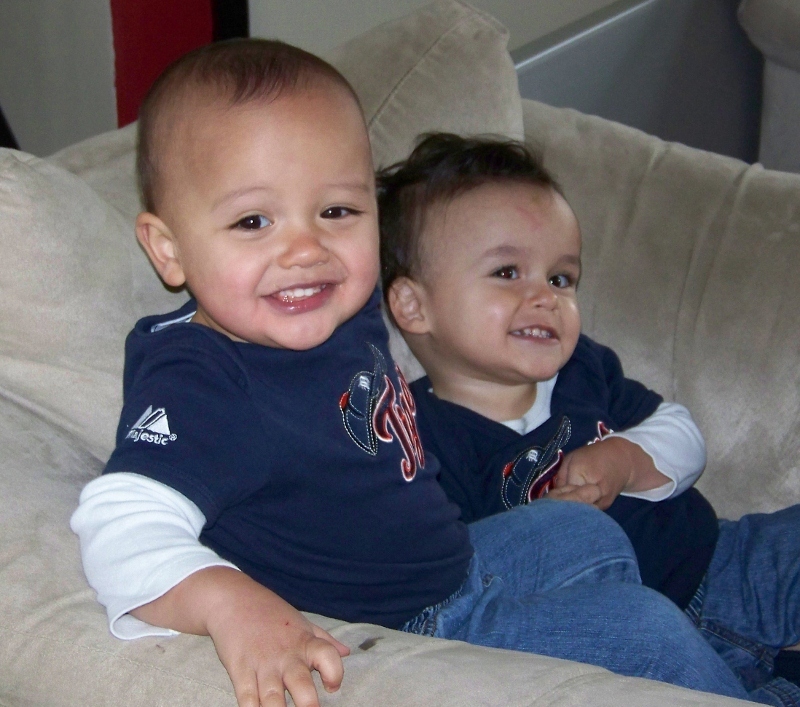 Those little heartbreakers are 21 months old today. I can't beleive it. The Detroit Tigers opened their season on April 5th here at home. In showing ourTiger spirit here in the Williams household, I bought the boys new shirts for the summer. Here they are waiting for the game to start….even though they have no clue! It was too cute not to post. The Tigers ended up winning their home opener and are off to a pretty good start this season. Go Tigers!! We took the boys to the Zoo on April 6th. It was a nice day out and the week ahead was going to be chilly and rainy so we decided last minute to take advantage and do something fun. They had a pretty nice time and since the weather was cool, a lot of the animals were out that we usually miss during the hot days of summer. We got to see the Lions, the Polar Bears, the Grizzly Bear, Giraffes, Gorillas, Zebras and many more. We celebrated Easter with my family on Saturday April 7th up in Frankenmuth, MI. 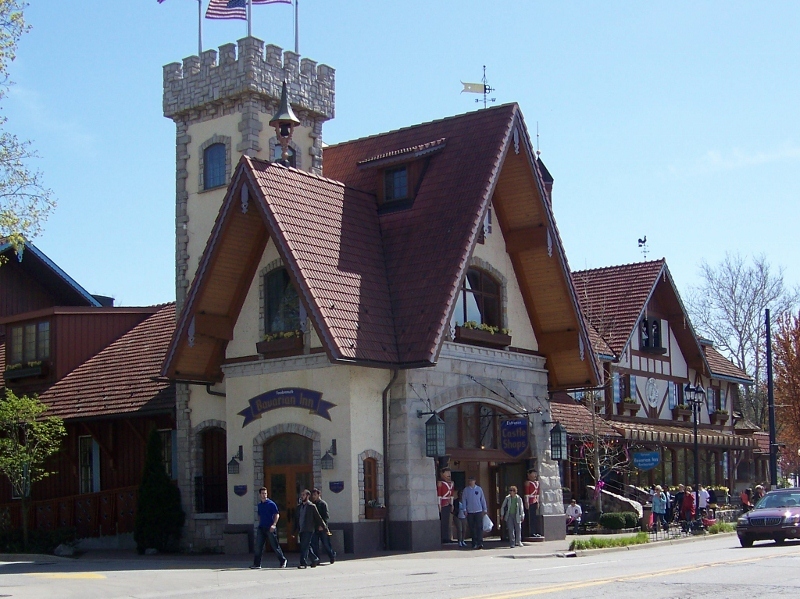 I mentioned in a previous post that Frankenmuth is a little German town about an hour north of us. It was a beautiful day so we got to walk around a bit before and after dinner. We even got to see an old friend of ours; Mason the horse. 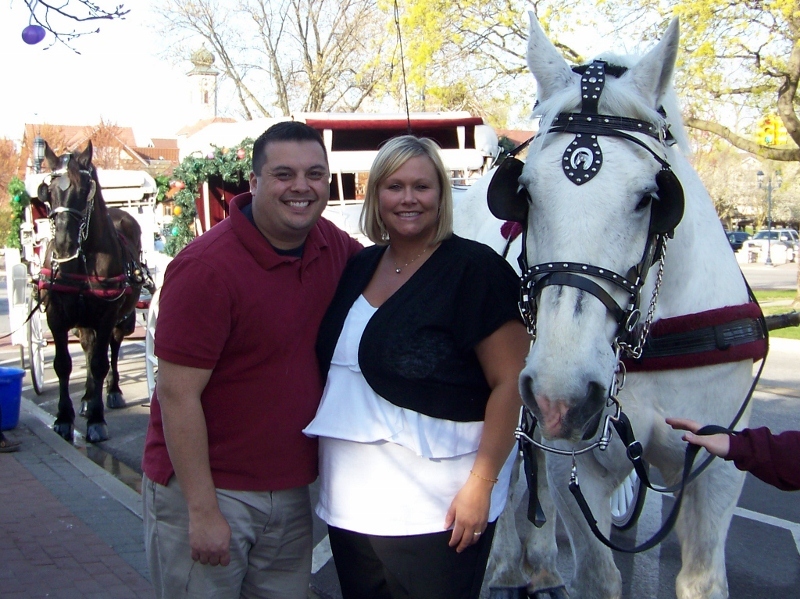 Mason was the horse that pulled our carriage when Eric proposed to me. We haven’t seen him in 7 years and he was working that day so we got to see him and get our picture taken with him just like we did back then. Grandma wanted to keep the boys overnight for us this week, so Eric and I had a full 24 hours without the kids. That’s the longest we’ve been away from them since they came home 18 months ago. The last time we had a night away was in October so this was much needed and very much appreciated. We got to go out to dinner and a movie and didn’t have to hurry home to pick the kids up. We even got to sleep in a little which was really weird! The house was so quiet. They behaved like angels of course and weren’t all that excited to see us….what’s that about? Alex saw the Physiatrist this week and we have decided after this appointment that we are ready to try someone different. There is another Doctor in the area that we are going to try and see what he has to say. Our current Doctor makes us wait an hour in the waiting room and then rushes through the appointment and we always leave confused. It shouldn't be that way. Alex is what matters and we have to make some changes that will suit him better. The warm weather has passed and cooler temps have set in. That means less time outside, no walks with the wagon and no trips to the park. It shall return someday soon (hopefully) but until then we are stuck inside! That’s ok, Alex and Evan don’t seem to mind! We had a great run of summer like weather here in Michigan for about two weeks, so we got to wear shorts, play outside and take in the warm air. But, it’s Michigan and we all knew it wasn’t going to last. So, we are back to reality, although this weekend is looking nice for Easter – Sunny and 60. We are heading up to Frankenmuth, Michigan on Saturday to celebrate Easter with my family. Frankenmuth is a small little German Town about an hour north of where we live. It’s famous for their Chicken Dinners, family friendly hotels, cute little shops and of course Bronner’s Christmas World – the largest Christmas store in the world. It’s also the place where Eric proposed to me so it holds an extra special place in my heart. J I am excited to go for the day because it’s something different for a change and I don’t have to cook. If I remember to take pictures, I will post some next week. Last Friday in Physical Therapy, Alex decided he would take off walking in the Gait Trainer! I was blown away, in fact I was in so much shock I didn’t even have a chance to cry like I usually do when he does amazing things. Evan was with us, so I was trying to keep him out of trouble and didn’t even realize Alex was taking off. I did end up getting it on video and I will post it as soon as I figure out how to get it off my new phone! He didn’t move the trainer on his own (his therapist Kate helped) but I have never seen him take steps like that before. He did it again today. I am so proud of that boy for all he has done and seeing him accomplish new things will never get old. He is so amazing and such an inspiration to me. I only have one word to describe Evan lately: Funny. He has his Dad’s personality and sense of humor all the way. He LOVES to make people laugh. At first, I thought it was just Alex he liked to get laughing, but I have noticed more and more he is after everyone. The thing is, is that he KNOWS he’s funny too – which is even cuter. He is babbling in his own language more and more so I think it is only a matter of time before he starts talking. He knows a few words like juice, cheese, sock, shoe and Dada is his favorite at the moment. The tantrums are still prominent and I don’t think they will be going away anytime soon. I am sure it is only the beginning. He loves to give hugs and kisses and my favorite is when I don’t even have to ask. Something new we have started before bedtime is cuddle time with the boys. We bring them into our room to cuddle for about 15 minutes before we put them to bed. It really helps all of us relax and wind down after a long day. They don’t seem to cry as long when we put them to bed. I know the cuddles won’t last forever so I am really trying to enjoy them now! It’s amazing how much my life has changed in two years. Before I became a Mom, I only had myself to worry about and focus on. Now it’s the exact opposite. I feel like I have completely lost myself in motherhood and I need to find a way out so I can balance who I am as a Mother to Alex and Evan and who I am as Keri. My life is totally different than I thought it would be. I always knew I would get married and have children, but my plan was a little different than what actually happened. I did indeed get married and when we decided to start a family, I planned on going back to work after my maternity leave. Instead, I got laid off, had twins (one would later be diagnosed with cerebral palsy) so going back to work right away really wasn’t an option. I love being a stay at home Mom. I get to be home with my boys, watch them play, see their milestones and raise them the way Eric and I planned. It’s a little tough financially, but more so for me it’s hard because I put 110% into my boys and have lost sight of what I want. I never really saw myself as a big career woman, but I have always enjoyed working. Being out of the workforce now for almost two years I feel a bit rusty and a little scared of stepping back out when the time comes. I have some big choices to make: I know I should go back to school and add to my education, but I am not sure where I want to go with that. I already have a business degree, but when I think about going back for more, it bores me. I would love to go into the medical field, but I am not sure where to begin. I really can do whatever my heart desires, the question is, how hard does my brain want to work? It’s a tough challenge for me because I am home all day with the boys and I don’t get much down time, so I would more than likely have to take online courses and do my work in the evening. Half the time my brain is fried by the time the boys go to bed, so I am going to have to figure out a way around that. I do plan on going back to work someday, it's just figuring out which direction I want to go in. I want to better myself not only for me, but for my family. The time is now! Well, enough about me as I'm sure you are wondering what is going on with my little munchkins since it’s been a couple of weeks, so I will get on that for you. Thanks for reading and feel free to offer up some suggestions if you have any regarding the medical field.